Westminster fashionable talk dictates that we need to rebalance the economy towards manufacturing. But manufacturing is declining as a proportion of the world economy. Manufacturing is great. It offers decently-paid jobs to those who want to develop their skills, rather than spend their lives in front of a keyboard. In many ways it is less risky than finance as a major driver of the economy. Thus the great and the good sat around on a particularly weak edition of Newsnight last night – elsewhere in the programme a disabled activist with severe Crohn’s disease who has just had her benefits cut was queried as to why she was being nasty to the government – asking how we can rebalance the economy towards manufacturing. The problem with such an attitude is that it is running against history. 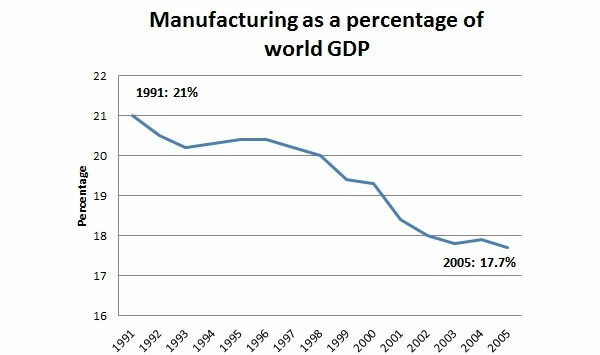 As Graph 1 shows, manufacturing as a proportion of the world economy declined from 21 per cent of the world economy in 1991 to less than 18 per cent in 2005 (data from earthtrends). 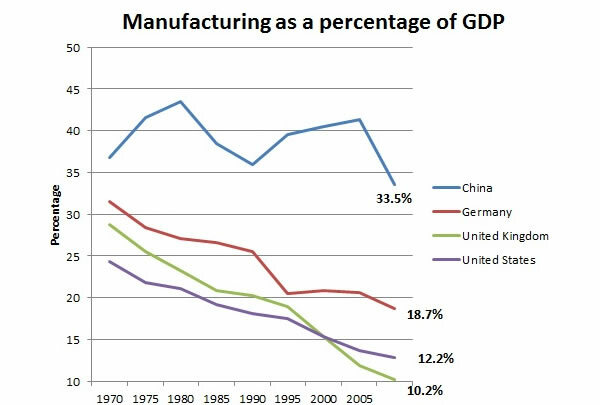 Even in the country often hailed as the template for developed countries to follow in manufacturing, Germany, it has been a case of managed relative decline. As graph 2 shows, Manufacturing’s proportion of the German economy has fallen from more than 31 per cent in 1970 to less than 19 per cent in 2010 (statistics derived from United Nations data – calculations here). It is true that the proportion of the economy devoted to manufacturing has fallen far steeper in Britain than other countries. However, even if we came up to German 2010 levels, we would only be building up manufacturing to being a similar proportion of the economy as it was in the UK in 1995 – and even that would take a miracle. Ultimately, the only way to expand manufacturing as a proportion of your economy is to have a large inefficient agricultural sector, thereby producing an impoverished peasantry who are then drawn to factories and supply cheap labour. But since we aren’t China – or Britain in the late 1700s – this is not going to happen. If we had more pro-manufacturing public policy, we could hang on to more of our manufacturing jobs and this would be a good thing. But any serious discussion around ‘rebalancing the economy towards manufacturing’ is ignorant. A jet engine has 40 thousand moving parts. It gets sold with 30 year maintenance contracts. 25% of value of a boeing dreamliner is manufactured in Uk- how many chinese carrots do u think that equates to? U think JCB is better of making wheat? ?